Au Boeuf Rouge price per day from CHF 129 Quietly located in Crassier, Au Boeuf Rouge offers rooms with free Wi-Fi and a flat-screen cable TV. 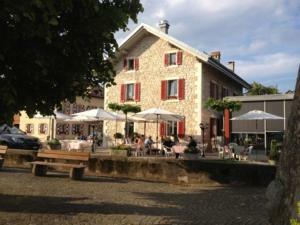 Lake Geneva and Nyon are both an 8-minute drive away. For the children’s entertainment, a playground is provided on site. 13. Take exit 10-Coppet toward Divonne. 14. Slight left onto Route de Divonne. 15. Turn right onto Route de Bogis-Bossey. 16. Continue onto Route de Chavannes-de-Bogis. 17. Slight left onto Route de Crassier. 18. Continue onto Route de Genève. 19. Slight right onto Rue de la Rippe. 20. Take the 1st right onto Rue de la Tour. 21. Turn right to stay on Rue de la Tour. Ski resort Blonay, number of cross country pistes: 20km. 57 km from town of Crassier. Ski resort Bourg-St-Pierre, altitude: 1910m. 93 km from town of Crassier. Ski resort Anzère, downhill pistes: 40km. 95 km from town of Crassier.